Hub City Press, 9781891885822, 74pp. 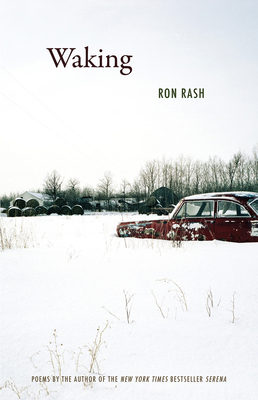 Rooted in places like Watauga County, Goshen Creek, and Dismal Mountain, the poems in Ron Rash's fourth collection, Waking, electrify dry counties and tobacco fields until they sparkle with the rituals and traditions of Southerners in the stir of their lives. In his first book of poetry in nearly a decade, Rash leads his readers on a Southern odyssey, full of a terse wit and a sense of the narrative so authentic it will dazzle you. As we wake inside these poems, we see rivers wild with trout, lightning storms, and homemade churches, nailed and leaning against the side of a Tennessee mountain. A two-time PEN/Faulkner Award Finalist, Rash has been compared to writers like John Steinbeck and Cormac McCarthy. With his eye for the perfect detail and an ear for regional idiom, Rash furthers his claim as the new torchbearer for literature in the American South. Here is a book full of sorrow and redemption, sparseness and the beauty of a single, stark detail--the muskellunge at first light, a barn choked with curing tobacco, a porch full of men and the rockers that move them over the same spot until they carve their names into the ground, deeper, even, into the roots where myths start, into the very marrow of the world.